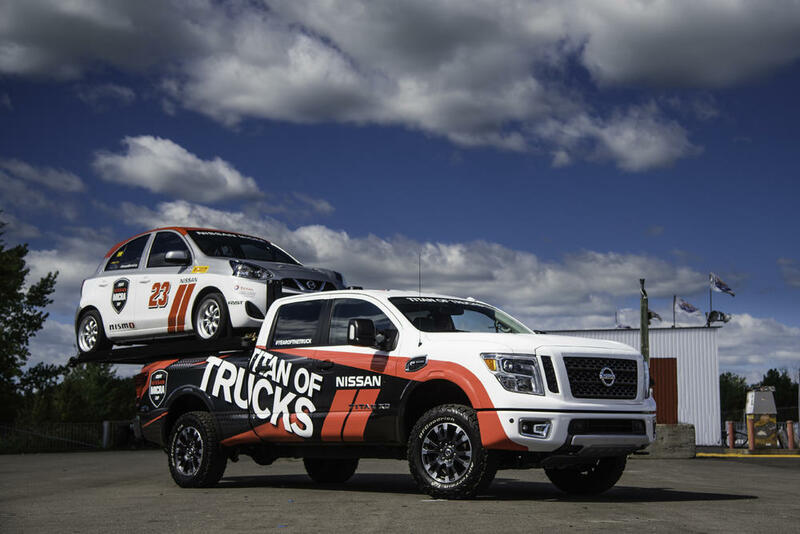 This weekend, Nissan will present its TITAN Hauler XD project truck at Canadian Tire Motorsport Park for the last Micra Cup race in Ontario of the season, bringing together the extremes of the Nissan Canada line-up – the TITAN XD full-size pickup truck and the Micra subcompact. The TITAN Hauler XD project truck builds on the production. TITAN XD’s already exceptional towing and hauling capabilities by almost doubling the payload rating with a Nissan Micra secured in the truck bed. The Nissan TITAN Hauler XD project truck effectively puts Canada’s most affordable racing series on a pedestal as the second season enters its final month in the 2016 calendar. The TITAN Hauler XD project truck was developed entirely by Quebec-based Motorsports in Action (MIA), with a customized aluminum rig that was affixed to the bed of the TITAN XD. The deployment is operated by an electro hydraulic pump that operates cylinders that move the platform on and off the truck. The platform holds the Nissan Micra Cup race car in place while the platform itself moves forward and backwards for precise loading and unloading. The payload capacity of the TITAN HAULER XD prototype’s bed is almost double the already impressive payload capacity rating of the Nissan TITAN XD, which was achieved through strategic reinforcement of the TITAN XD chassis and suspension. In production form, the TITAN XD Crew Cab offers some of the effortless towing and hauling of the larger, more expensive heavy-duty trucks – including an available maximum towing capacity of 12,314 pounds (diesel engine) and maximum payload capacity of 2,594 pounds (gas engine) when properly equipped – yet has affordability closer to a half-ton pickup. Nissan will launch its first single cab full-size pickup truck this fall, in both the TITAN XD and TITAN half-ton variants. The single cabs will have the power, torque, heavy duty chassis and durability demanded by today's demanding worksites – including the highest towing capacities and payloads in the ever-expanding TITAN lineup. “We are excited to see the reaction of racing enthusiasts at this weekend’s race at Mosport, where they will see the TITAN Hauler XD project truck for the first time,” concludes Paiva.